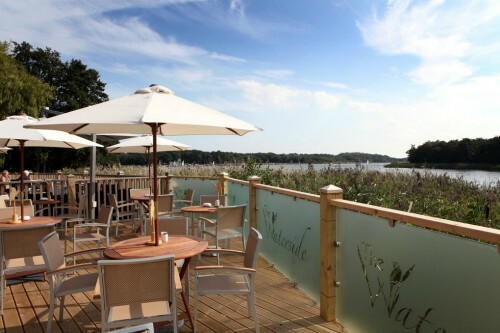 The Waterside Rollesby is a really unique and special place to drop in for brunch, lunch, tea or coffee and while away an hour or two admiring the stunning view overlooking Rollesby Broad. This is an extremely popular stopping off point for anyone wanting breakfast, lunch, tea or coffee! And it’s not surprising really – the view across the open Broad is stunning. The actual building that houses the cafe has been newly built and is in a really lovely setting overlooking the reeds and onto Rollesby Broad. Rollesby Broad is one of the Trinity Broads, along with Ormesby and Filby. These Trinity Broads aren't connected to the more popular and busy Broads around Wroxham and Potter Heigham that you’ve probably heard of. These three broads are also landlocked so there are no commercial cruisers on these waters which makes it a wonderfully quiet place to come and enjoy a bite to eat. From the decking, you can appreciate the views over the water and beyond. If it’s a little bit colder, come inside but still enjoy the views! It’s a place to totally relax and unwind whilst enjoying the food and drink on offer. And if you’re bringing children, there’s no need to worry too much about the safety aspect as the decking, the children’s play area and the putting area are all enclosed, either by wooden fences or frosted glass surrounds. I wasn’t sure what to expect with regards to food, but it was excellent. 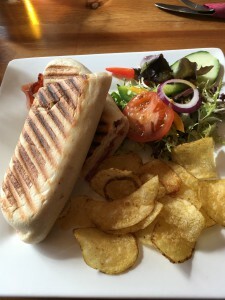 I had a light lunch – a delicious pannini which hit the spot! The menu is extensive and I know it gets changed according to the seasons. Good portion sizes too! You can see more about the menus here. And yes, The Waterside is dog friendly, but the dogs must be on the lead and under control. They’re not allowed in the play area which is understandable. There’s also plenty of parking here. Right next door to the café is an enclosed secure children’s play area with lots of wooden play equipment for them to scramble around on. There are also picnic tables here where you can have your food and watch the children at the same time. Picnics are not allowed, all food eaten needs to have been bought from The Waterside Rollesby. 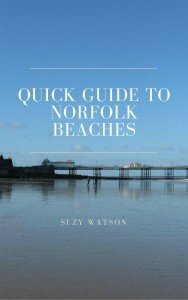 This is a fairly unique place, so why not make the most of it while you’re here and enjoy the food on offer. Fancy “mucking about on the water”. Not literally of course, but why not lap up an hour on the Broad in one of their rowing dinghys or, if you feel a little lazier, one with an outboard motor. They have 2 person, 4 person or 6 person boats ready for you to enjoy a trip on the Broad. You can book the boats from April to September. It is probably best to book in advance to ensure you get what you want, but you can always just turn up as well and hope that there will be a boat available. 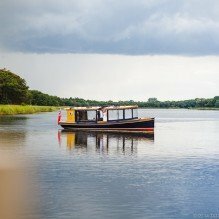 If you felt like a short guided boat trip around Rollesby Broad followed by a bite to eat, The Waterside Rollesby can arrange for you to do this in the Edwardian wooden launch called Gentleman Jim. This lasts for approximately 30 mins and runs from 11am – 4.15pm on most days. This is the boat that can also be used if you hold your wedding at The Boathouse. You arrive in style at your wedding venue as the bride-to-be! No dogs are allowed on the boats and sometimes during the summer months the outboard boats may not be available due to the weeds in the Broad. For you fishing enthusiasts who need your fix of fishing, The Waterside offers fishing on Rollesby Broad for a half day or a whole day. Fish such as pike, bream and roach, amongst others, can be caught here (all fish caught have to be released). Grab yourself a rowing boat, or a dinghy with an outboard, and see what lies in wait! All you need to do is bring your own equipment, and of course the elusive patience! Pre-booking for the fishing is essential. You can find prices and contact details here on The Waterside Rollesby website. As with all the Broads, Rollesby Broad has its fair share of Norfolk wildlife. 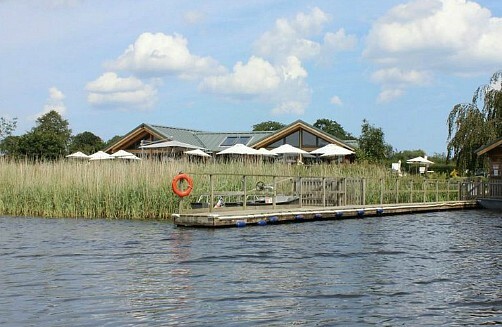 The Waterside has its own hide, perched on the edge of the Broad and a stone’s throw from the café. You can while away the hours watching the wildlife from here or just watch life going by from the terrace decking at the café. You may well see marsh harriers, kingfishers, teal, the resident heron and many more species that preside here! 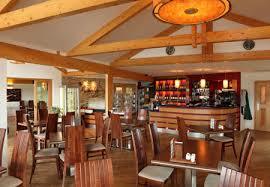 The Waterside Rollesby is open all year round, 7 days a week. Tea is from 2-3pm, and if you want the scones, it is advisable to book the day before! It isn’t open in the evening, but that’s not a problem, because then you can just drive the short distance along the road to The Boathouse and have a meal there in the pub or restaurant overlooking another Broad! 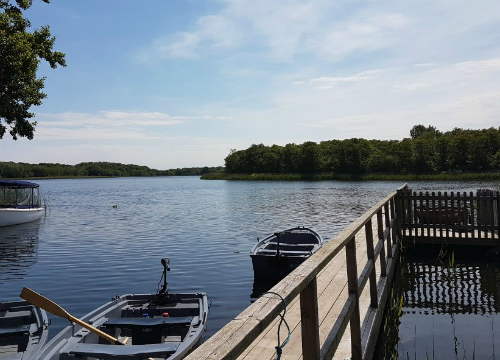 You’ll find that The Waterside Rollesby is an excellent stopping off point for a few hours to enjoy the peaceful and tranquil surrounds along with having a bite to eat. You can read more about The Waterside here and discover it for yourself!